Stained glass panels at Canterbury Cathedral, previously thought to be the work of Victorian restorers, have been found to date to the late 12th century, making them the earliest known art works depicting pilgrims travelling to Canterbury. Researchers have just made the exciting discovery at the beginning of a detailed study of the world-renowned Miracle Windows in the Trinity Chapel. 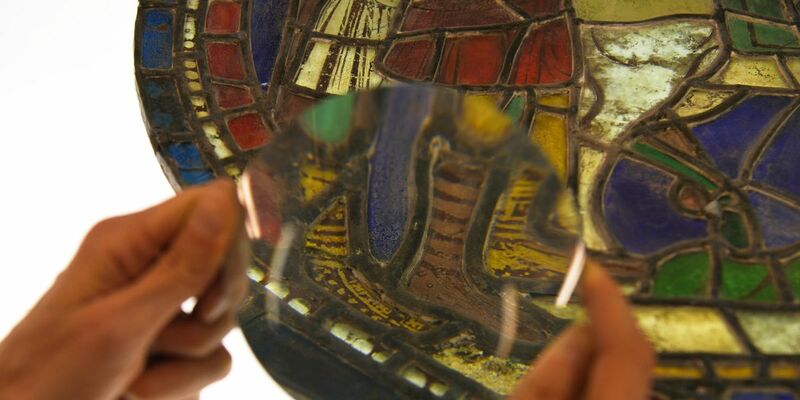 An analysis of the panels, currently removed from the window and in the stained glass conservation studio for study, proved that they date back to the 1180s, within 20 years of Thomas Becket’s death and 200 years before Chaucer wrote The Canterbury Tales. One of the panels shows pilgrims on foot, pilgrims on horseback and a disabled pilgrim on crutches on the road together. The incredible detail includes the bright green and yellow boots of the pilgrims, which were painted with horizontal stripes and a polka dot decoration. This highly elaborate footwear may have been meant to underline the importance of the pilgrimage. A second medieval panel, also thought to have been a Victorian restoration, depicts pilgrims arriving at Canterbury and queueing up to receive the blood and water relic, a much diluted mixture of Becket’s blood that pilgrims drank in the hope of miraculous healing. Dr Koopmans is an associate professor of history and is writing a new catalogue of the glass relating to Thomas Becket in the Cathedral. The project is funded by the Friends of Canterbury Cathedral and Dr Koopmans’ residence is supported by a Visiting Fellowship from the British Academy. After the panels had been studied and analysed, they were returned to the window. You can learn about some of the findings in the short film below.